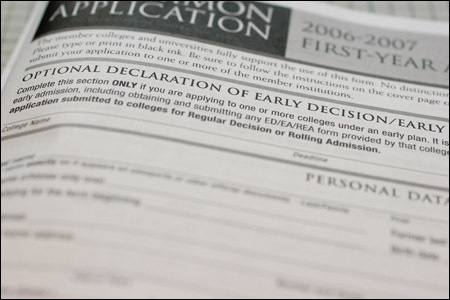 Early university admission programs tend to be unfair: The offers are made before financial aid decisions, meaning they can only really be taken by the wealthy. Harvard and Princeton got rid of them, in part, on this basis. Only problem: Nobody followed suit. Other universities continued to offer early admission, and this week, both Harvard and Princeton decided they no longer wanted to be the unilateral cooperators in a field of defectors. For a program like this to succeed, I think there needs to be an institutional underpinning. The unilateral action of a couple schools (even leaders like Harvard and Pton) won’t resolve this social dilemma. What is needed is a way to get schools to collectively commit to ending early admission, and create strong enough sanctions to keep any single school from defecting, accepting early admissions, and reaping the benefits. But what might an institutional solution look like? One thing that springs to mind are the institutional arrangements for the shared handling of undergraduate applications. Imagine if schools that viewed each other as competitors for the same students (say, the 60ish heavyweights of the Association of American Universities) created a new centralized agency for centralizing their application processes, or expanded the ambit of the Common Application group to include a policy role. They could set shared policies for applications (for example, no early admission); only schools who played ball on these shared policies would be able to benefit from the pool of applicants and cost savings associated with centralization. Unfortunately, such institutional arrangements may be challenging. Previous attempts at coordination (on aid policies, through the Overlap Group) attracted the attention of the antitrust jakes at the Justice Department, leaving schools skittish about coordination. It’s unfortunate that both Harvard and Princeton have had to roll back an important step toward diversity and access in higher education. I admire their verve in trying to set an example — but I’m pretty confident the early admissions dilemma won’t be solved with unilateral action.